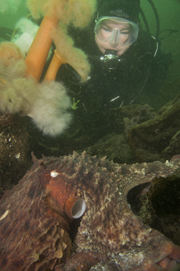 Nice article/post about offshore Oregon diving. 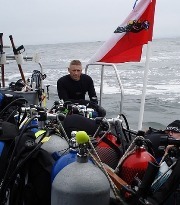 Re: Nice article/post about offshore Oregon diving. I have done a bit of diving out of Crescent City, and a bit less of shore diving out of Brookings, and I thought the article was great. I have had days out at the Point St. George Lighthouse when I could see the bottom from about 30-50 ft above it. And the last time I was over their, a couple of years ago, we easily had 30' of vis at some unnamed rock poking out of the water. Most of the diving down there bottoms out out at ~100ft. With lots of nice yummy rockfish and black snapper. Man I love oregon coast diving! Thanks for the great write-up. We'll dive the jettys periodically, but from we're told it's just a sandy bottom offshore. I'd still like to try it sometime, but my brothers are usually more interested in diving for groceries, which makes us look for more interesting topography. Typically we'll choose between Newport or Charleston, depending on the forecast. Do you dive offshore from Tillamook much? Nice to talk to the author. Let me know when you have a trip planned out of Newport. I'd love to come along sometime. Do you guys ever dive out of Florence? Thanks for posting that. I have dove in and around Tillamook Bay but have never made it out of Yaquina Bay. The hardest thing about diving the coast, especially when you work Monday-Friday, is getting a weekend where tides and weather all come together to work for you. It always seems like one or the other is not behaving. Or, forces beyond your control ruin diving for the best part of the year for coast diving . Next summer for sure, or maybe a calm fall, winter, spring weekend. A nice write-up, with fair warning.